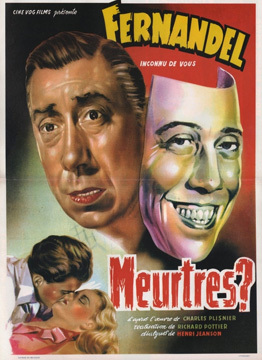 (1954) 100min. Directed by Jean Delannoy. Screenplay by Antoine Blondin, Jean Delannoy, Roland Laudenbach & Gian Luigi Rondi from the short story Silent as the Grave by Cornell Woolrich. Photographed by Pierre Montazel. Edited by James Cuenet. Music by Paul Misraki. 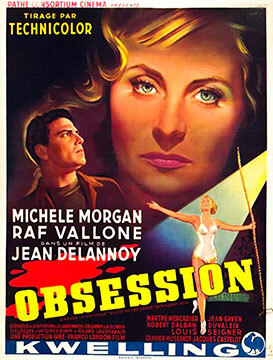 With Michèle Morgan, Raf Vallone, Marthe Mercadier, Jean Gaven, Albert Duvaliex, Robert Dalban, Jean Toulout, Dora Doll, Raphaël Patroni, Martine Alexis, Olivier Hussenot. Noël Annequin is the black sheep of a social-climbing bourgeois family who married for love and stayed in the country while his professional brothers were improving their social position. When his beloved wife, dying of an incurable disease, begs him to end her misery, Noël agrees to do so, but informs his brothers that he wants to be tried for murder. Terrified by the scandal this would bring to their reputation, Noël's brothers move with lightning speed to silence him. (1950) 115min. Directed by Richard Pottier. Adaptation by Charles Plisnier and Maurice Barry; dialogues by Henri Jeanson from the novel by Charles Plisnier. Photographed by André Germain. Edited by Hélène Battini. Music by Raymond Legrand. With Fernandel, Jeanne Moreau, Mireille Perrey, Jacques Varennes, Colette Marueuil, Germaine Kerjean, Philippe Nicaud, Georges Chamarant, Line Noro, Raymond Souplex.